Gift-giving has always been a love of mine. There's something about the process of planning, purchasing, and packaging that screams heartfelt love and intention. So when I spotted Kenzie's idea of creating a gift-giving wishlist--or a list of gifts you want to give--I knew I had to create my own. For me, my goal for presents is to buy one known gift, or something that they've requested, and a surprise gift, too. That way, they get something they want and something they didn't know about. So here's a list of gifts I've gotten, plan to buy, and/or want to buy for others. There are goodies for co-workers, kids I babysit, my sisters, and a few other friends and loved ones, too (and maybe a few things I'd love...). I had to be careful which ones I shared (I can't spill all my secrets! ), though! And I'd also love to hear what you want on your own Christmas wishlist! You can create your post and share it for this month's The Circle coming this Wednesday, December 17th! p.s. Looking for a way to buy surprise gifts for loved ones that they'll actually love and want? This past year, my sister and I have started using Pinterest (as well as Etsy) to create lists of gifts we love and would want to receive. This way, we can surprise each other with gifts we actually want! Those sticky notes are fab! ahhh i've done a giveaway with urban bird and co! they are sooo awesome and i LOVE their products! And those slippers are definitely swoon-worthy. Love them. It's such a good book! I have a copy and have been wanting a copy of my own for some time now and finally have it. You should definitely add it to your list--if you mind me asking, what else do you have on that list? A couple of things on my wishlist are The Forest Feast cookbook (SO pretty!! ), a new peacoat, and a new floating cross necklace. :) How about you!? Ooh! Those sound awesome! I've never heard of that book but the title itself sounds so interesting. And a peacoat and cross necklace sound great, too. 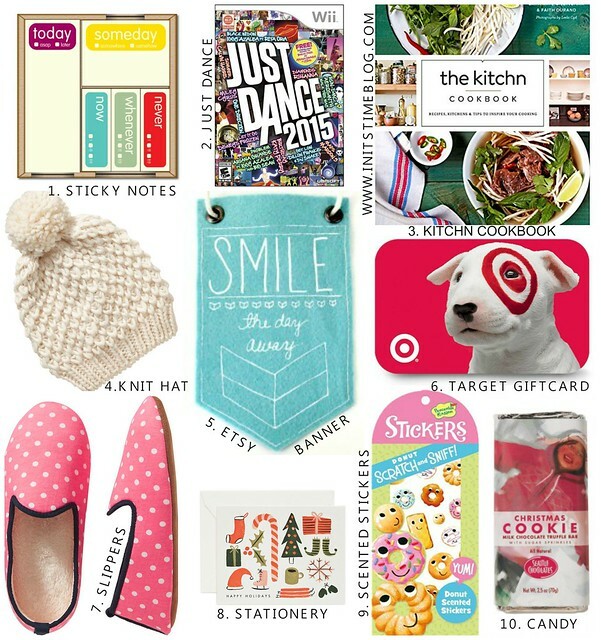 :) I actually just shared my wishlist on the blog (you probably already saw it but here's the link anyway: http://www.initstimeblog.com/2014/12/the-circle-december-2014-christmas.html).